Hello! 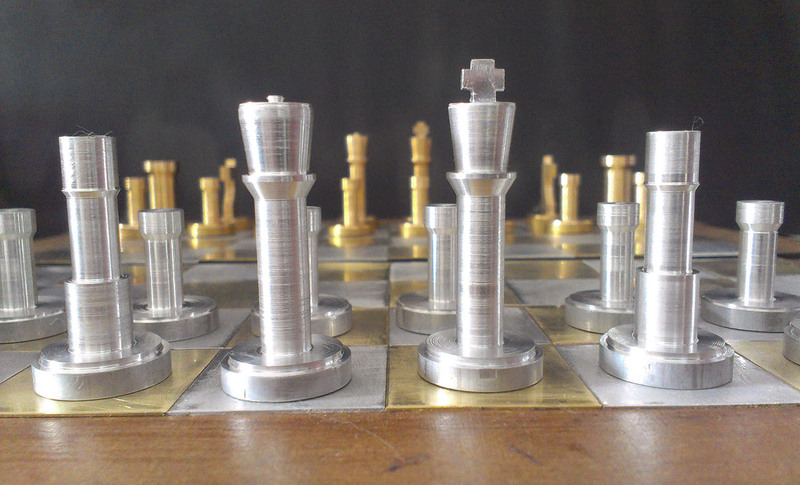 My name is Rutger Schönfeld, and I created a chess set in my spare time at the TU Delft. 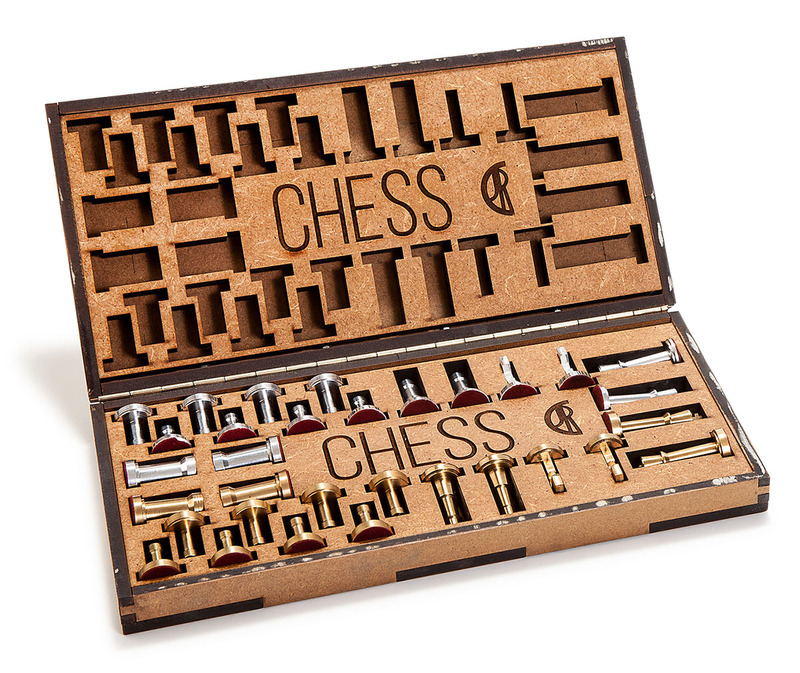 The inspiration for building this chess set came when I first walked into the workplace of the faculty where I study, which is Industrial Design Engineering in Delft. 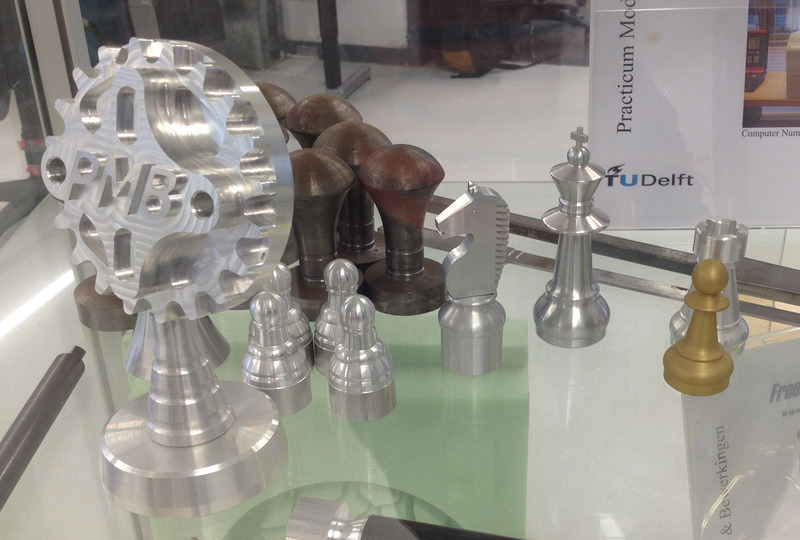 There is a large glass display cabinet at the entrance of this workplace, which contains different kinds of chess pieces, some are 3D printed, and others are turned. 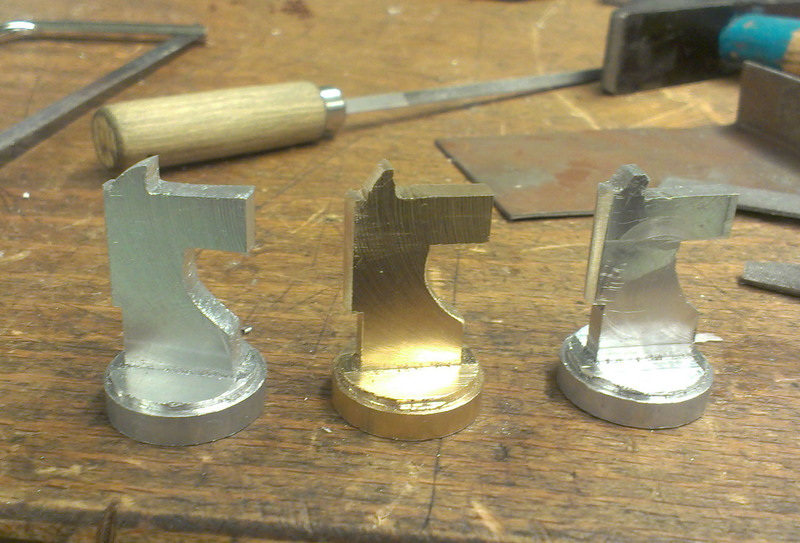 When seeing these pieces, the only thought entering my mind was: I want to make some chess pieces! 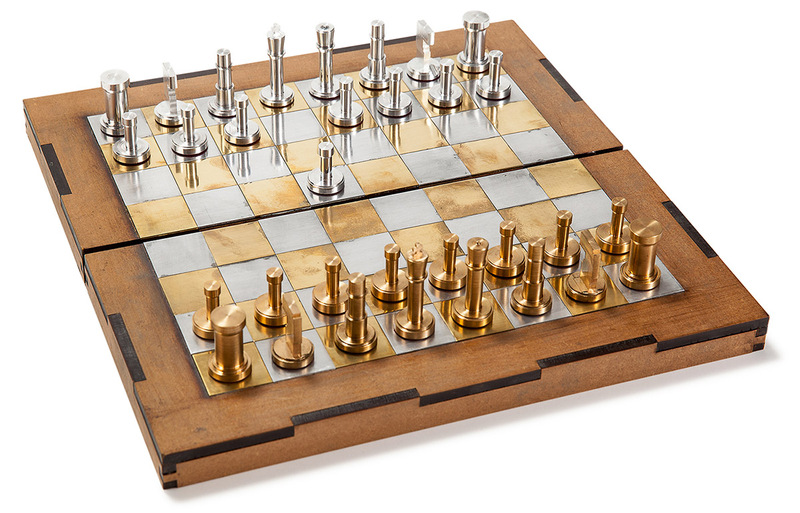 This set me up to design a simple chess set, consisting of turned brass and aluminum pieces. The first goal of this project was to teach myself the basics of turning and milling. The pieces are for that reason archetypical in shape and as basic as possible. When designing a chess set you will also need a board. In the same workplace there is also a laser cutter present. I decided to teach myself to use that machine as well. This whole project can therefore be seen as a learning experience, not to design the prettiest or most original chess set. After having quickly designed my pieces in design software SolidWorks, I ventured into the workplace. I started simple by beginning with the pawns, to get the hang of working with a lathe (machine used for turning). The pawns consist of a small cylinder grounded on a larger one. I bought a brass and an aluminum rod and started turning their shape. The hard part of turning pawns is the boredom; it costs a full eight hours of repetitive work to finish all the identical 16 pawns. And the danger of that is the loss of concentration while turning, which is very dangerous with such a machine. But after that I got the hang of the basics of turning. The rooks, bishops, kings and queens proved to be not as great a daunting task as I had first foreseen. If you can turn a pawn, than you can turn those as well. They just take some more time. The tricky bit of the king and queen was the top part, which I designed at an angle. To achieve this result, you have to adjust the cutting tool to the correct angle. The making of these pieces took two extra working days. The fabrication of the knights proved to be the most difficult part, both for the design and the building process. 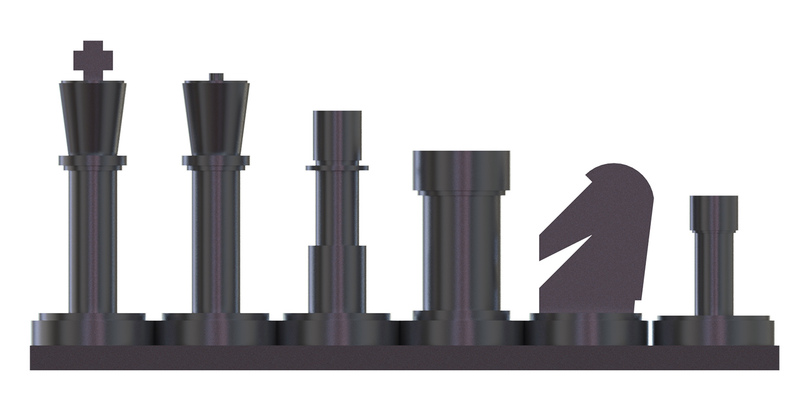 At first it was my plan to design an entirely cylindrical chess set. Unfortunately, knights are fundamentally non-cylindrical. This meant designing a flat part, which was put on top of a cylindrical base. For the production part, I started turning a cylinder in the right size. I continued by putting this piece into a milling cutter to get it in shape. Finally I used a file for the finishing. For the board, I bought a plank of MDF (processed wood), which is easy to cut under a laser cutter. I marked a large area on the plank that had to be engraved with a depth of 1 mm. 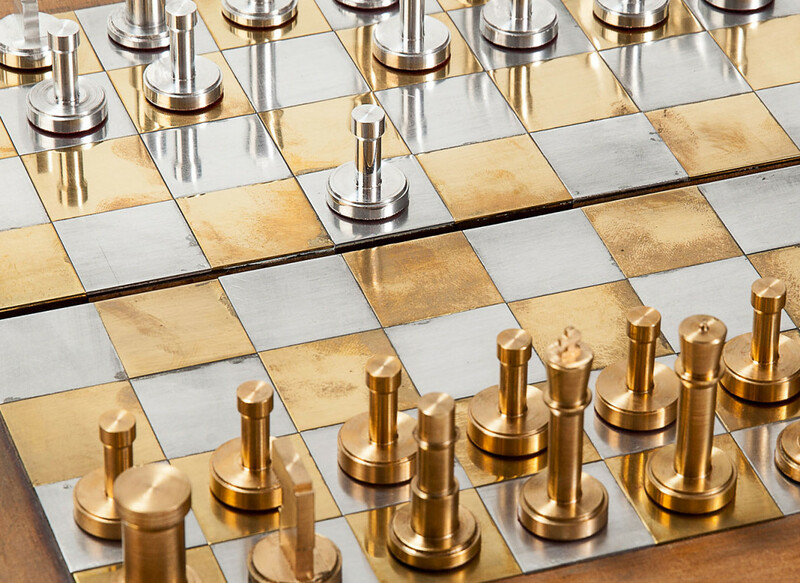 I ordered 32 squares (30x30x1mm) of both aluminum and brass; those would form the tiles for my chess board. 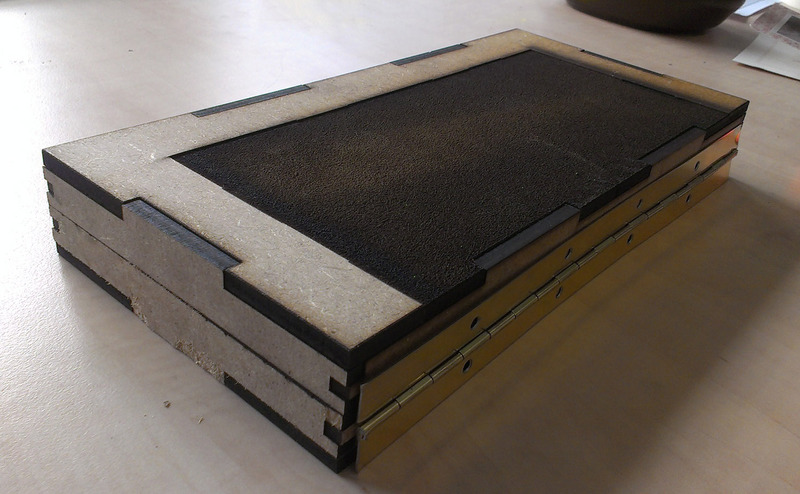 After carefully having glued all the tiles on the wooden board, I added a hinge so the board could be closed. 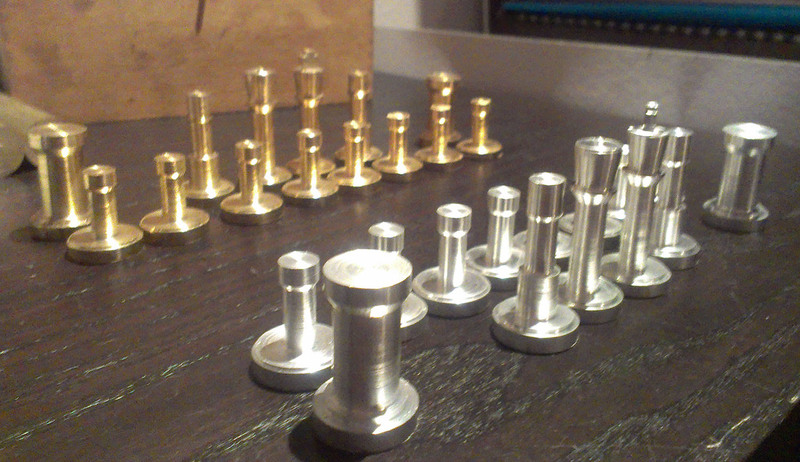 To finish the chess set, I polished all metal parts by using a substance called Belgom ALU, which is very suitable for both aluminum and brass. I lacquered the wood, using about three layers and added some red baize on the bottom of each piece to reduce the sound when a piece is moved and to avoid scratches on the tiles. What annoyed me after a while was that all the pieces kept moving around during transportation. I solved this by laser cutting two plates that hold all the pieces in place and to ensure a neat presentation when opened. I also added my logo on both parts and again lacquered them with three layers. I’ve never really turned or milled anything before, so I thought it was interesting to hear about the process, Rutger. 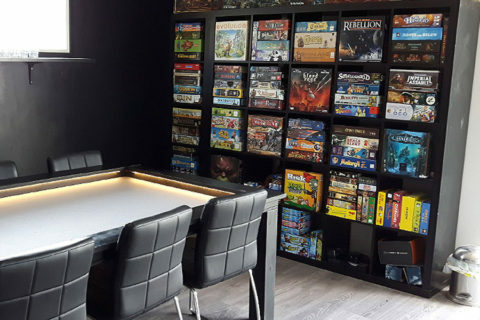 I also really like how you solved the problem of the chess pieces moving around the board during transportation — its a nice touch to the overall look of the board. Thank you for your positive reply! 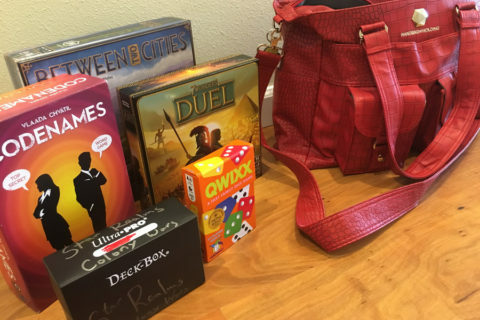 I hope you feel inspired to design/build a board game of your own. 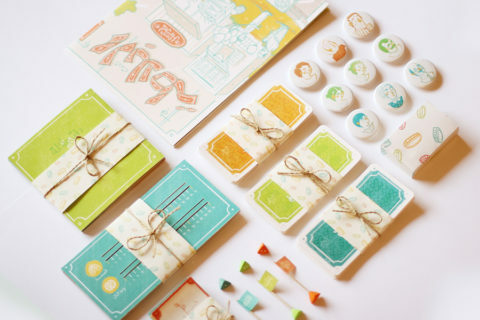 Can you suggest a place to order the materials you used for the squares? I am trying a similar project but a different style. Congrats on yours. I look forward to trying to put mine together. Hey Eric, I got the squares by ordering a piece of sheet metal and the guy at the workshop used his pneumatic industrial cutter to cut them to size. I do not know if you have such a cutter yourself or if you have a workshop nearby. Sheet metal can easily be obtained from places such as Aliexpress. If there is no other option, you could use a metal saw, but I would try to avoid that, I will not be as precise and way too much effort to consider it. Thank you for sharing this. I am making a custom chess set and was looking for custom designed boxes to hold the pieces. Your story has inspired me to use a laser cut material.